Carl Custaf SMG M45, s# 333689 Matching. Excellent bright fullered blade with first 2 cm blackened and broad arrow on ricasso. Blackened grip is marked N0.9 MK1 an E-54 (=ENFIELD 1954) PF, E37 and another broad arrow. Enfield inspection mark E 89 at the front. 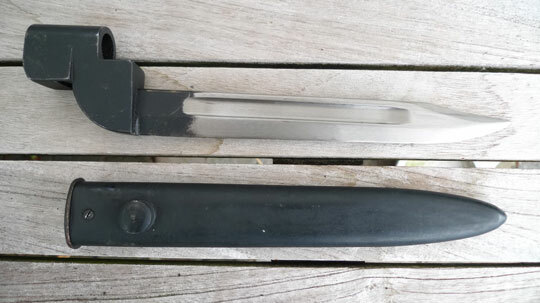 Excellent blackened scabbard with matching s# and PF. No dents. These serial and PF numbered N0.9 bayonets were used by Ireland Post WWII and issued with the Carl Gustav SMG.